The evidence is everywhere. In March, German shoemaker Adidas unveiled the world’s first yarn-made football boot, the Samba Primeknit (it’s lightweight, water-resistant and radiant, hued in a rainbow’s worth of bright colours). And last year, the decidedly un-fusty Ryan Gosling told GQ Australia that his perfect day would involve knitting. He apparently finds it quite cathartic, something, which is scientifically supported. According to a recent study published in the British Journal of Occupational Therapy, knitting is a salve for depression. Science and knitting have also come together in another unexpected way: so-called science knitting, where, instead of hats and scarves, the vogue is to craft models of the human anatomy, bacteria, germs and giant molecules. Knitting is also a growing trend in graffiti. 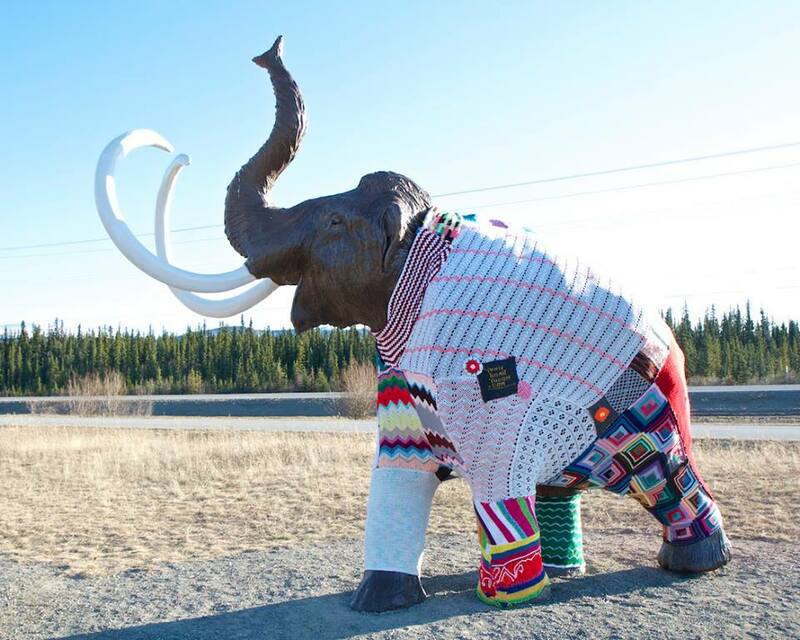 Known as yarn bombing (a.k.a. guerrilla knitting or knitfitti), the premise is simple: either a single knitter or an entire bee will take over an underused, unloved public space, building or object (bike racks and park benches are common targets), and give it new life by covering it in a bright, beautiful needle work. Unlike traditional graffiti, it’s not drippy, sloppy or gang-related. And because the defacement is the equivalent of doilies and leg warmers, it’s delightfully temporary, and doesn’t require a pressure hose and a lot of soap to remove. The movement started in Texas about 10 years ago, when store owner Magda Sayeg made a cozy to cover the door handle of her Houston boutique. Customers loved it, so she made another to cover a stop sign down the street, then branched out to other sites in the city. Sayeg now runs a yarn-bombing collective Knitta Please, and has helped take the trend global, wrapping an entire bus in Mexico City, parts of a shopping mall in Hong Kong, an a large, outdoor staircase in Sydney, Australia. Similarly, this summer, in Penetanguishene, on the shore of Ontario’s Georgian Bay, yarn bombing will be used to celebrate the bicentenary of the town’s historic fort, Discovery Harbour. Cannons, trees, benches and barracks will be covered. But the pinnacle will be the H.M.S Tecumseth, a full-scale replica of a 124-foot, 1815 warship. It will all be unveiled on July 25, and be on display until mid-September. So far, more than 45 volunteers have committed to the undertaking (each has to knit as many 12-by-12-foot squares as they can or want to) and more than 400 pounds (or two cargo vans worth) of yarn has been donated by Spinrite. This piece originally appeared in the Globe and Mail on Thursday, April 10, 2014. This entry was posted in Design Spy and tagged Adidas, Design, Downton Abbey, Knitting, The Globe and Mail, Toronto, Yarn, Yarn Bombing by mmhague. Bookmark the permalink.